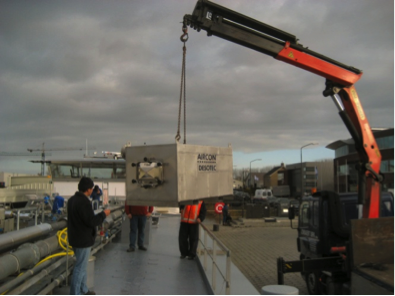 The shore side facilities at a loading berth include a moveable arm that connects to flanges on the ship in order to transfer liquid to and from the ship’s tank(s). To be able to return vapour to shore, a vapour return line can be added to the loading arm. Alternatively, a separate arm can be used to collect vapour. 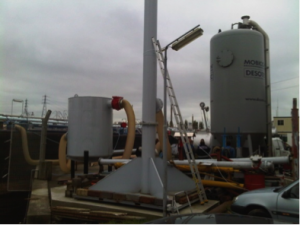 The main factor influencing the cost of a vapour treatment plant, is the maximum flow rate that needs to be treated and the type of VOC molecules that need to be removed. The type of VOC molecules or mixture of VOC molecules will eventually determine the installed technology. Treated as a waste product that is valorised as fuel for the cement industry (with or without conditioning). The product can either be installed in fixed bed system with or without regeneration system, but in a lot of cases mobile filter units like AIRCON® are a cost-effective solution. Don’t hesitate to contact us on VOC removal solutions, we’re at your service! DESOTEC Activated Carbon specialises in selecting the most appropriate activated carbon type and offering tailor-made purification solutions.